But not all of those tools produce sites that shine in a mobile world. That’s where Mobirise steps up. Mobirise is a free website builder that you can install on a Windows or Mac computer. From there, you design your own website starting with a default layout that is ready to customize and expand. 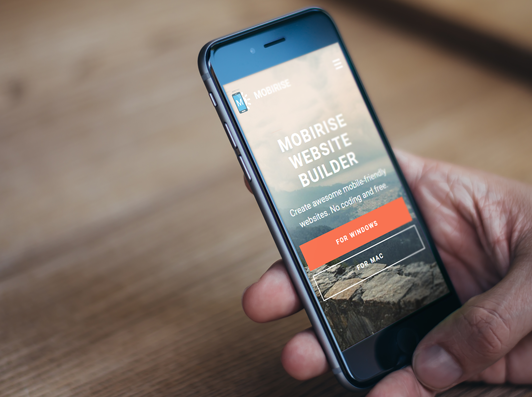 For me, Mobirise seemed like a Lego project made with a small collection or building blocks. In fact, the default site is divided into a series of segments called blocks. There’s one for a graphic header, another for photos, one for streaming media and so on. I started my Mobirise project by replacing the default header with an image from my photo collection. It didn’t display as well as I had hoped, so I replaced it with other images until I was satisfied. The more I experimented, the more comfortable I became with the Mobirise process. In other blocks I added photos and rewrote the default text. In a video block, I added a simple YouTube URL and Mobirise converted it into an embedded playable video. That was the fastest and easiest route I’ve ever taken to posting a playable video on a web page. At each step, I would click one of the three icons at the top of the Mobirise working window to see how my page will look on a desktop computer, on a tablet and on a handheld mobile device. After adding a couple of blank pages and inserting my own content, I was ready to publish. Mobirise offers the options to start the files and scripts that it created in a local folder, upload them to your own server using FTP or drop them in a folder on Google Drive. Finding and setting up a domain name is up to you. Experienced website builders and design professionals will probably complain that Mobirise is too limited and offers too few creative options. But an average computer user who needs a fast and simple website that looks good on all platforms will find that Mobirise delivers everything they need. DreamHost is ultimately one of the best website hosting company with plans for any hosting needs.